Further details of the children of Alexander Williamson and Agnes Hendry (or Henry) where known. Alexander married Agnes Hendry in Jan 1804 in New Monklands. Agnes was born before 1789. Janet Williamson born 7 Nov 1804 in Airdrie. Agnes Williamson born 25 Sep 1806 in Airdrie. For the census of 1841 Janet and her husband were living at High Street, Airdrie, with their four children. 1841 Census (7th June) Airdrie (651) Book 16. Page 3. For the census of 1851 Janet and her husband were living at 69 East George Street, Coatbridge. Their eldest daughter Catherine was living next door with her husband of four months Hugh O'Hagan who is recorded as a "Doctor of Medicine". 69 East George Street, Coatbridge. 70 East George Street, Coatbridge. For the census of 1861 Janet, William and their family were living on the corner of the main Edinburgh - Glasgow road and John Street, Brown's land. This seems to have been a substantial accommodation, 9 rooms with at least one window. Mary O'Hagan recorded as niece was almost certainly William's granddaughter by his daughter Catherine and Hugh O'Hagan. End of John Street - Brown's Land cont'd, Coatbridge. Janet Brown, nee Williamson, died on 8 Aug 1866 at Main Street, Coatbridge. The informant on the death certificate was her husband William Brown and she was recorded as the daughter of Alexander Williamson, Farmer, and Agnes Hendry, married to William Brown, Contractor, and aged 61 at the time of her demise. For the census of 1871 the widowed William and his family were still living on the corner of John Street and Main Street. Mary O'Hagan, was William's granddaughter by his daughter Catherine and Hugh O'Hagan, was still recorded in the household of her grandfather. William Brown died in in 16 Feb 1878. The death certificate recorded him as the widower of Margaret Williamson, aged 83, the daughter of -- Brown, a farmer, and Catherine Brown, maiden surname Carlin both deceased. He was recorded as dying at Brown's Buildings, St John Street, Coatbrdge, and the informant was Charles Brown, son, of Duntocher. Alexander Brash born on 18 Apr 1832 and baptised on 29 Apr 1832 in New Monkland, Lanarkshire. Lodging at 44 Maxwell Street in Glasgow in the household of Hugh and Catherine Munro, recorded as aged 18 and employed as a cooper. (SCT1851/644 Enumeration District: 12, Page: 20) Nothing more currently known. Agnes H. W. Brash born on 26 Oct 1834 and baptised on 16 Nov 1834 in New Monkland, Lanarkshire. With the family aged 16 for the 1851 census. Nothing more currently known. Janet C. Brash born on 21 Jan 1837 and baptised on 19 Feb 1837 in New Monkland, Lanarkshire. With the family aged 14 for the 1851 census. Nothing more currently known. James C. Brash born on 22 Nov 1838 and baptised on 30 Nov 1838 in New Monkland, Lanarkshire. James, a cooper, died aged 22 and single on 17 May 1861 in 16 South Street, Airdrie. Isobella Brash born on 19 Dec 1840 and baptised on 19 Feb 1841 in New Monkland, Lanarkshire. Alive in 1841 but possibly died in infancy between 1841 and 1846 as second child named named Isabella born in 1846. Isabella Brash born on 21 Jun 1846 and baptised on 26 Jul 1846 in Free High Church, Airdrie, Lanarkshire. Possibly died in infancy no child named Isabella with the family in the 1851 census. Margaret W. Brash born on 11 Apr 1849 and baptised on 30 Apr 1849 in Free High Church, Airdrie, Lanarkshire. Margaret died aged 18 and single on 18 February 1868 in 14 South Bridge Street, Airdrie. For the 1841 census Robert was living with his family in South Street, Airdrie. James born 1838 is not recorded with the family but re-appears in the 1851 census so may simply have been missed off. 1841 Census (7th June) New Monkland (651) Book 3 Page: 14. For the 1851 census Robert and his family were recorded still in South Street, Airdie, with Robert recorded as employing 4 men. Neither the Isabella aged 1 in the 1841 census nor the Isabella born in 1846 are recorded in this census and it would seem that they had died in infancy. 14 & 16 South Street, Airdrie. For the 1861 census Robert, his wife and this three youngest children were still recorded at South Street, Robert is recorded as employing "1 Man & 2 Boys". Presumably this includes his sons. 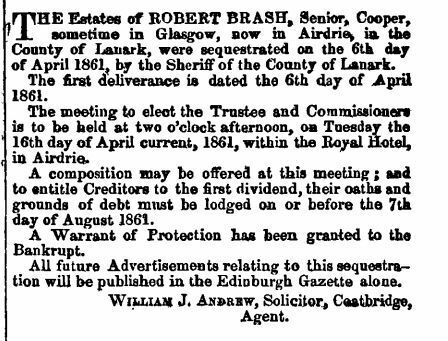 I am not entirely sure what the mood would have been in the household as the next day the Edinburgh Gazette contained a notification "The Estates of ROBERT BRASH, Senior, Cooper, sometime in Glasgow, now in Airdrie, in the County of Lanark, were sequestrated on the 6th day of April 1861, by the Sherriff of the County of Lanark." For the 1871 census only John the youngest son is recorded with his parents, although the family are still in South Street and one assumes have survived the financial difficulties of a decade ago. Agnes Williamson died on 6 Oct 1879. The death certificate recorded her as aged 59 married to Robert Brash, a Cooper, and the son of Alexander Williamson, a farmer, and Agnes Williamson, maiden surname Hendry, (both deceased). She was recorded as dying at 11 South Bridge Street, Airdrie, and the informant was Robert Brash, widower - present. Robert Brash died on 2 Mar 1882. The death certificate recorded him as a Cooper, aged 74, widower of Agnes Williamson, the son of Robert Brash, and ??????? Brash, maiden surname McLachlan, (both deceased). He was recorded as dying at 11 South Bridge Street, Airdrie, and the informant was Robert Brash, son, 50 Surrey Street, Glasgow. John Craig born about 1837 in Glasgow, Lanarkshire. Informant on his mother's death registry entry, and mentioned in his mother's will. John married Mary Muir on 9 Sep 1870 in Manhattan, New York, USA. Mary was born 9 December 1847 in Neilston, Renfrewshire, the daughter of John Muir, a farmer, and Mary Gilmour. John and Mary had the following known children: John M(uir?) Craig born about 1869 in Helensburgh, Dumbarton; James Craig born on 8 Dec 1871 in Blair Mains, Logie, Perthshire; Margaret Y(oung?) Craig born about 1877 in Glasgow, Lanarkshire; Thomas Craig was born about 1879 in Glasgow, Lanarkshire; Viola \ Violet born about 1882 in Glasgow, Lanarkshire. (It is from the birth certificate of James Craig born 1871 that we have the wedding date and place of his parents John and Mary.) For the census of 1881 John, his wife and family were living at 1 Roslea Drive, Glasgow (Barony, Glasgow (644-3) Book 39 Page 8) with John was employed as a Collector of Police etc Assessments. For the census of 1891 John and Mary were living at 182 Whitehill Street, Dennistoun, Glasgow (Dennistoun , Glasgow (644-3) Book 36 Page 5) with John was employed as a Police Rates Collector. Their eldest son John was not recorded in the household. For the census of 1901 John and Mary were living at 24 Burnbank Gardens, Kelvin, Glasgow (Kelvin , Glasgow (644-9) Book 62 Page 12) with John still employed as a Collector of Police Rates. John Craig died 12 January 1912 whilst resident at 24 Burnbank Gardens. Alexander Craig born about 1839 in Glasgow, Lanarkshire. Alexander, a Bank Teller. Alexander married Elizabeth Gibb, born approx 1839, the daughter of Richard Gibb and Mary Peffers on 2 October 1873 in Battlefield, Cathcart . Elizabeth died on 5 November 1879 in Glendhualt, Cove, Dumbarton. Alexander died on 15 December 1886 in 66 St. Vincent Crescent, Glasgow. I suspect there were no surviving children from this union. Margaret Craig baptised on 11 Jun 1842 in Glasgow, Lanarkshire. Margaret married Robert Young on 11 Jun 1860 in Clyde, Glasgow. Margaret and Robert had the following children: Margaret Williamson Young was born on 10 Sep 1861 in Blythswood, Glasgow, Lanarkshire; James Hamilton Young was born on 14 Jun 1868 in Anderston, Glasgow, Lanarkshire; Robert Young was born on 12 Sep 1874 in Anderston, Glasgow, Lanarkshire. For the census of 1861 Margaret and Robert were living in the Blythswood district of Glasgow (Blythswood, Glasgow (644/6) Book 9 Page 4) with Robert listed as a Corn factor. For the census of 1871 Margaret and Robert were living at 24 St. Vincent Street, with their youngest son James (Barony, Glasgow (644-8) Book 888/8 Page 19). Robert was recorded as a "Grocer & Commission Agent". Their daughter Margaret born 1861 is not listed in the household and may have died in infancy. Sadly it would seem that Margaret died in 1877 in Anderston, Glasgow. For the census of 1881 what I am fairly certain are the two youngest children, James and Robert, were living just down the road from their grandmother at 24 St Vincent Crescent, Glasgow (Barony, Glasgow (644-10) Book 69 Page 6). The two children were presumably in the care of the servant, Catherine Russell, aged 51 from Falkirk who was recorded in the household. Where their father was is currently unknown. Thomas Craig born about 1844 in Glasgow, Lanarkshire. Thomas died on 18 October 1875 at 47 St. Vincent Crescent, Glasgow. He was recorded as aged 31, unmarried and a Commercial Traveller. For the census of 1841 Margaret and John were living in Argyle Street, Glasgow with their two children John and Alexander. 1841 Census (7th June) Glasgow (644/01) Book 264/1. Page 3. For the 1861 census Margaret was listed as a Provisions Dealer resident at 357 Argyle Street. Her three sons are also listed in the household with John the eldest recorded as a Corn Factor, and Alexander and Thomas as General Clerks, presumably working in the family business. Margaret missing from this census married Robert Young on 11 Jun 1860 in Clyde, Glasgow. For the census of 1871 Margaret was visiting the in-laws of her niece, Agnes Williamson. This was of course Ebenezer Hendry and Isabella Thomson at the Station Hotel in Stirling. For the census of 1881 the widowed Margaret was living alone at 66 St Vincent Crescent, Glasgow. For the census of 1891 Margaret was still at 66 St Vincent Street, Glasgow. She was listed as "Living on Private Means", and had a servant Catherine McLellan from Duirinish, Ross-shire in her household. Margaret Craig, nee Williamson, died on 23 Mar 1892, at 66 St Vincent Crescent, Glasgow. The informant on the death certificate was John Craig her son of 9 Broompark Terrace, Glasgow, and she was recorded as the widow of John Craig, a provision Merchants, the daughter of Alexander Williamson, a farmer, and Agnes Hendry, and aged 81 at the time of her demise. Identified as son of Alexander and Agnes on the basis of his death certificate which gives his parents as Alexander Williamson and Agnes M.S. unknown, and the various censuses which give his place of birth as Airdrie \ New Monkland. The ages given on later censuses records and his death certificate give a date of birth circa 1818. For the 1841 census what is assumed to be "our" John was lodging at with the Lee family. 1841 Census (7th June) Barony Glasgow (622) Book 41. Page 5. He is marked as "not born in the county", which is obviously wrong, but his age and profession I think are sufficient to believe this is our John Williamson. With Ann Lee also marked as not born in the county and a daughter Agnes one could speculate as to whether Ann could possibly have been a relation of John's, possibly even a sister? Note - After the death of John Craig, Provision Merchant and Victualler, husband of Margaret Williamson, John's sister, the Inventory which included the valuation of the stock of his three shops - Cumberland Street, North Street, and Argyle Street, was carried out by John Williamson and John Wallace. Given John's residence in 1841 with the Lee's of North Street, it is possible that he was working for his brother in law John Craig in his shop in North Street at the time of the 1841 census. In 1849 it would seem that John opened his own grocery business as in a "Review of Businesses" dated 1888 there is an article referring to the his establishment, (481-483 Sauchiehall Street by that date), which states that "the business is of considerable antiquity dating back to 1849 when it was founded by its present proprietor John Williamson"
It was about this time or possibly a few years earlier that John married Janet Craig Bunting, the daughter of John Craig, a grocer, and Annabella Craig. Janet was born on 21 Jul 1825 in Glasgow, Lanarkshire. Helen Williamson born on 1 Dec 1850 in Barony, Glasgow, Lanarkshire. Agnes Williamson born on 22 Nov 1852 in Barony, Glasgow, Lanarkshire. Margaret Williamson born about 1854 in Glasgow, Lanarkshire. Jannette Bunting Williamson was born on 24 Dec 1858 in Blythswood, Glasgow, Lanarkshire. Alexander Williamson born on 21 Mar 1861 in Blythswood, Glasgow, Lanarkshire. Anna Mary Williamson born on 14 Feb 1864 in Blythswood, Glasgow, Lanarkshire. James John Williamson born on 18 Feb 1868 in Blythswood, Glasgow, Lanarkshire. For the census of 1851 John and Janet were living at 9 Richard Street in Glasgow with their baby daughter Helen. John was now recorded as a Victualler in his own right. For the census of 1861 John and his family were living at 8 St Georges Road, Glasgow. John is listed as a grocer. Annabella Buntin Janet's younger sister was recorded with the family for this census. For the census of 1871 John and his family were living in Blythswood, Glasgow. John is listed as a Merchant rather than a simple Grocer and was employing 10 men and 6 boys..
Helen missing from this census was living at 181 West Regent Street, Glasgow with a household servant Agnes Wilson. John, her husband, the master mariner, was presumably at sea. Agnes, John James and Anna Mary missing from this census were recorded in a household along with Annabella Bunting, Head and Housekeeper at 10 Crichton Street, Millport, Cumbrae, a house which sits on the shorefront looking across to Millport Harbour. Although the children are recorded as visitors, one assumes that this Annabella was in fact the sister of Janet as per the 1861 census, and therefore Agnes, John James and Anna Mary were actually her nephew and nieces. In 1888 the business was mentioned in the "1888 Business Reviews"
The establishment of this business is of considerable antiquity, dating back to the year 1849, when it was founded in the present premises by Mr. John Williamson. In 1865 the style of the firm was changed to Williamson & MacLeod. In 1870 Mr. John Williamson became the sole proprietor. The business is carried on in extensive and commodious premises, comprising a large double shop devoted to the grocery and Italian goods, with an additional shop for the wine and spirit department. There is also on the premises a very large area of cellarage, well stocked with a choice selection of wines and spirits of the best brands and finest vintages. The business of this firm receives in every department the personal supervision of the proprietor, and is conducted with marked ability, energy, and enterprise. There are few, if any, houses more fully representative of all the best features of the various lines engaged in. Mr. Williamson possesses the advantage of long and thorough mercantile experience, and the connections of the firm are well founded upon the eminent reputation it has so long enjoyed. On 29 January 1891 Janet Williamson, nee Bunting passed away. The death certificate recorded her as aged 65, married to John Williamson, a grocer, the daughter of John Bunting, a callendar, and Annabella Bunting, maiden surname Craig. She was recorded as dying at 13 Queens Crescent, Glasgow, and the informant was John Williamson, widower, who was present at her demise. For the census of 1891 the widowed John was living in 13 Queens Crescent, Kelvin, Glasgow. listed as a Grocer. John's eldest daughter Helen was still living at 181 West Regent Street, and, as ten years previously, her husband was absent but she had the company of a servant Margaret Boyd. His other married daughter, Margaret, was living at 51 Great Western Road, Glasgow, with her husband David, and two children James aged 4 and Janet under 1 month. Also in the household was Margaret Wood, a general Domestic Servant and Elizabeth Stevenson, a Lady's Nurse, obviously in the household to care for Margaret and her new baby. Sadly the Hardie family seem to have been dogged by disaster. Janet Bunting Williamson, the baby in this census, died on 21 April 1892 of Whooping Cough. The death was recorded at the family home at 51 Great Western Road, Glasgow. This tragedy was compounded within days by the death of their son James who also died of Whooping Cough 5 days later on 26 April 1892. The death was recorded at 13 Queens Crescent, his grandfathers house, although his usual place of residence was given as the family home at 51 Great Western Road, Glasgow. Almost a year to the day later Margaret herself died on 27 Apr 1893. The death certificate recorded her as aged 38, married to David Hardie, a chemical salesman, the daughter of John Williamson, a grocer, and Janet Williamson, maiden surname Bunting (deceased). The informant was David Hardie, widower, who was present at her demise, and the place of her demise as 51 Great Western Road, Glasgow, Lanarkshire. She seems to have died due to complications during labour as the cause of death was listed a "Nervous prostration. Obstructed labour. Exhaustion and evidence of septic exhaustion". Whether the baby survived is unknown but the odds would seem to have been against it. Assuming this to be the case I believe that there were no surviving children from the marriage to David Hardie . The widowed David died 7 years after the death of his wife, on 1 Mar 1900. The death certificate recorded him as aged 48, a Drysalter's manager, widower of Margaret Williamson, the son of James Hardie, a Master Mariner (deceased), and Lilias Hardie , maiden surname Bowden. He was recorded as dying at 5 Melrose Street, Glasgow, and the informant was Thomas Hardie, nephew, 19 Afton Crescent, Glasgow. On 29 Nov 1898 James John Williamson, John and Janet's youngest son, died. The death certificate recorded him as a mercantile clerk, aged 30, unmarried, the son of John Williamson, a grocer and wine merchant, and Janet Carrick Williamson, maiden surname Bunting both deceased. He was recorded as dying at 25 Lynedoch Street, Glasgow, and the informant was Alexander Williamson, brother, of the same address. For the census of 1901 John and his remaining children were living in 25 Lynedoch Street, Kelvin, Glasgow. John is listed as a retired grocer, with his son Alexander now listed a grocer in his own right. John Williamson died on 16 Jun 1902. The death certificate recorded him as a licensed grocer, widower of Janetta Bunting, aged 85, the son of Alexander Williamson, a farmer, and Agnes Williamson, maiden surname unknown, (both deceased). He was recorded as dying at 23 Napiershall Street, Glasgow, and the informant was Alexander Williamson, son. The whereabouts of the John's remaining children for the 1911 census has not been found as of yet although they should be resident in Woodend Drive, Glasgow. Jannette Bunting Williamson died, unmarried, on 28 Oct 1916. The death certificate recorded her as aged 57, unmarried, the daughter of John Williamson, a grocer, and Janet Carrick Williamson, maiden surname Bunting, (both deceased). She was recorded as dying in a nursing home at 121 Hill Street, Glasgow with her usual place of residence being 89 Woodend Drive, Glasgow, and the informant was Alexander Williamson, brother, of 89 Woodend Drive, Glasgow. Alexander Williamson died on 8 May 1922. The death certificate recorded him as a licensed grocer, aged 61, unmarried, the son of John Williamson, a licensed grocer, and Janet Williamson, maiden surname Bunting, (both deceased). He was recorded as dying at 483 Sauchiehall Street, Glasgow - Usual Res: 89 Woodend Drive, Glasgow, and the informant was Agnes Williamson, sister, of 89 Woodend Drive, Glasgow. The address his demise was recorded at was the family's grocer shop and the cause of death Myocarditis, so it seems he died of a heart attack at his place of work. His demise signalled the winding up of the Grocery business in Sauchiehall Street as notified in the Edinburgh Gazette of June 1922. Helen Williamson died on 16 Jan 1931 . The death certificate recorded her as aged 80, widow of John Craig, Master Mariner, the daughter of John Williamson, a grocer, and Janet Carrick Williamson, maiden surname Bunting, ( both deceased). She was recorded as dying at 30 Kersland Street, Glasgow, and the informant was Chas. A. Craig, brother in law, Belgians, Craignethan Road, Whitecraigs. I suspect that John her husband died about 1927. It is believed that she and her husband John had no children. Anna Mary Williamson died on 28 Dec 1935. The death certificate recorded her as aged 71, unmarried, the daughter of John Williamson, a grocer, and Janet Carrick Williamson, maiden surname Bunting, ( both deceased). She was recorded as dying in Western Infirmary, Glasgow with her usual place of residence being 89 Woodend Drive, Glasgow, and the informant was J. W. Hendry, cousin once removed of 4 Boleyn Road, Glasgow - my grandfather. Agnes Williamson died on 26 Jan 1936. The death certificate recorded her as aged 83, unmarried, the daughter of John Williamson, a grocer, and Janet Carrick Williamson, maiden surname Bunting, ( both deceased). She was recorded as dying in Glasgow Royal Mental Hospital with her usual place of residence being 89 Woodend Drive, Glasgow, and the informant was J. W. Hendry, cousin once removed of 4 Boleyn Road, Glasgow - my grandfather. If I am correct in my assumption that there were no surviving children from the marriage of Margaret Williamson and David Hardie, and that Helen Williamson and her husband John Craig had no children this particular Williamson branch ended with the demise of Agnes. John Craig's father John Craig snr. was born about 1813 in Inverkip. Renfrewshire. He had married John's mother Jean Kilpatrick on 3 Aug 1843 in Glasgow, Lanarkshire. and as well as John they had at least one other child, James born on 16 Mar 1847, and baptised on 4 Apr 1847, Hutchesontown Relief Church, Glasgow. Thomas Craig born on 10 May 1850 and baptised on 16 Jun 1850, Hutchesontown Relief Church, Glasgow. Isabella Cockburn Craig born on 17 Nov 1855, Anderston, Glasgow, Lanarkshire. Hedley Vicars Craig born on 12 Oct 1857, Anderston, Glasgow, Lanarkshire. Christina Aitchison Craig born on 29 Nov 1858, Anderston, Glasgow, Lanarkshire. David Skinner Craig born on 4 Apr 1860, Anderston, Glasgow, Lanarkshire. Janet Skinner Craig born on 14 Apr 1862, Anderston, Glasgow, Lanarkshire. George Skinner Craig born on 2 Sep 1865, Anderston, Glasgow, Lanarkshire. Alexander Aitchison Craig born on 8 Jul 1868, Anderston, Glasgow, Lanarkshire. Charles Aitchison Craig born on 15 Jul 1871, Blythswood, Glasgow, Lanarkshire. John Craig snr. died on 27 Dec 1879, Glasgow, Lanarkshire. His second wife Janet died in 1915, in Partick, Glasgow, Lanarkshire. Thomas born on 13 Oct 1830 in Barony, Glasgow, Lanarkshire. James born about 1833 in Barony, Glasgow, Lanarkshire. John born about 1835 in Barony, Glasgow, Lanarkshire. Janet born on 23 Sep 1838 in Barony, Glasgow, Lanarkshire. David born on 28 Dec 1841 in Barony, Glasgow, Lanarkshire. After Janet's death James married Lilias Bowden. Lilias was born on 5 Aug 1814 in Grangemouth, Stilingshire, the daughter of Richard Bowden and Lillias Wyse. James Hardie and Liias Bowden were married on 14 Nov 1843 in Barony, Glasgow, Lanarkshire. She died in 1900 in Kelvin, Glasgow, Lanarkshire. Richard born about 1844, Glasgow, Lanarkshire. Lillias Wyse born on 10 Sep 1846, Glasgow. It is believed she married Thomas Scoular, born 10 Jul 1843 in Avondale, Lanarkshire son of Gavin Scoular and Janet Steven on 11 Nov 1880 in Canada. Lillias died on 28 Feb 1929 in Vancouver, British Columbia, Canada. A daughter born sometime between 1843 and 1855 in Glasgow, Lanarkshire who died in infancy in Glasgow, Lanarkshire. Francis W. Hardie was born about 1853 in Glasgow, Lanarkshire. Elizabeth Wyse born on 23 Jun 1855 at 11 Greenlaw Place, Glasgow. William Wyse born on 13 Feb 1858 in Tradeston, Glasgow, Lanarkshire. James died on 16 Dec 1861 in 145 Paisley Road, Glasgow. 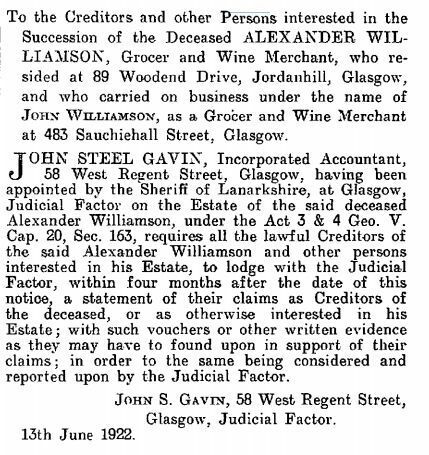 The entry in the indeex of wills and testan=ment ins=dentifies him as Commander of the Steamship "Lynx" and residing ar Grenlaw Place, paisley Road, Glasgow.